I realized today when I was working on the specifications to support pre-RFP opportunity pursuit and capture, that nearly all of the functionality could be achieved right now using the current version of the MustWin Performance Support Tool. Sure, it would lack some of the automagic streamlining we're planning, but the core of what you need to use it during the pre-RFP phase is already there. I love it when things work out like that. It confirms that we're on the right track with how we've designed the architecture. Because the plan is to stick as close to the same database structure as possible and to use the same instruction-based information model, you can do much of what we’re working on right now. You’ll just have to do some things manually and it will require more clicks than it will when we officially add the pre-RFP support. Within the paper-based MustWin Process, we recommend Readiness Reviews. So we definitely want the new features to support that, as well as be flexible enough to support the myriad gate reviews and pursuit processes already in use at companies. The first step is to add a “proposal.” Maybe we’ll rename that to a “pursuit.” But functionally it doesn’t matter. The next step is to create your “outline.” An outline item is really just a container. 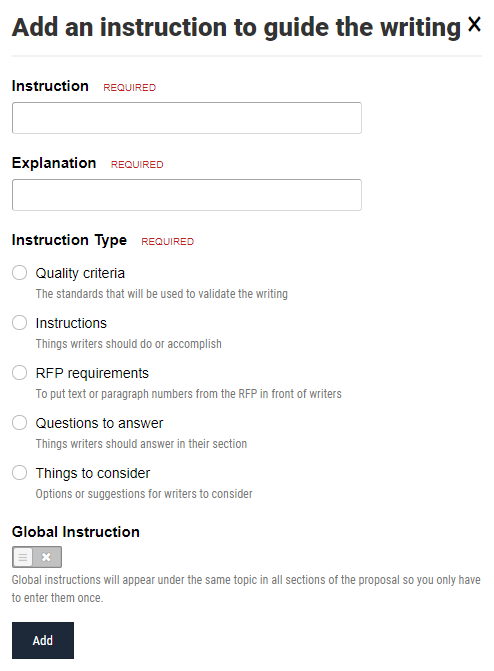 The outline might contain an item for each Readiness Review or gate in your process. Plus any other topics or containers you want to have. In essence, what you're doing is setting up the structure of your capture plan, along with any pre-RFP reviews and bid/no bid meetings. Try numbering your outline as decimals less than one (0.x). That way, they won’t conflict with the future proposal outline and you’ll end up able to have your pre-RFP information right next to your proposal information when the RFP is released. 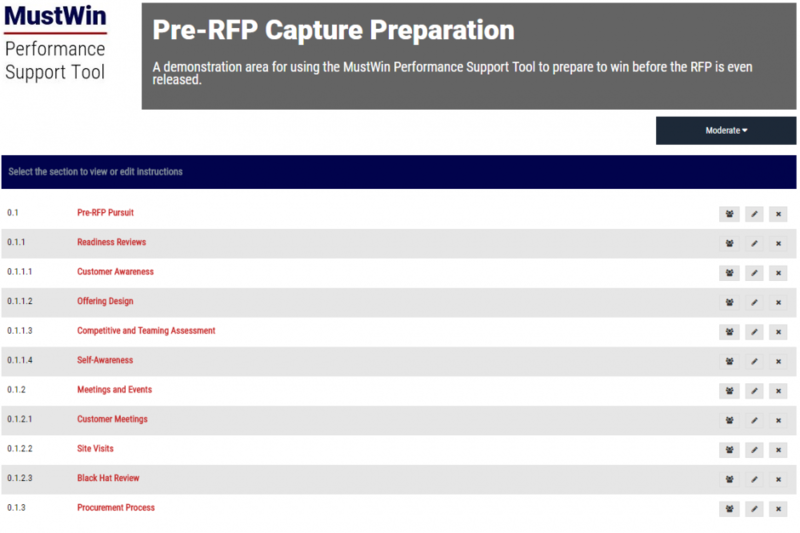 Our plan is to automate creating the pre-RFP outline, and enable you to save and reuse your own. Here is a sample outline to try. When you enter an outline item, you’ll see the topics we use in Proposal Content Planning. Not all of them are relevant to pre-RFP pursuit, so we’ll be changing them. For now, some of them will come in handy and the rest you can ignore. Within the relevant topics, you’ll want to add instructions and questions for your sales or business development staff to seek answers to. You can use the current instruction adding functionality to do this. We’ll be creating a default list of off-the-shelf questions that will instantly import. And it will be customizable. But for now you can manually enter the questions from the Readiness Review methodology or from our Master Proposal Startup Information Checklist. If you structure your pre-RFP pursuit around answering questions, the way we like to do, then your sales and business development staff can answer the questions by using the discussion feature. Every instruction item added automatically comes with a discussion area. You can use this to plan, review, and clarify your answers as you work to develop an information advantage ahead of the RFP release. When the RFP is finally released and it’s time to start the proposal, you’ll need to convert the information you gathered into input for the Proposal Content Plan. This will involve creating an RFP compliance matrix in order to develop your proposal outline and adding it in the MWPST. Once the outline is ready, you’ll need to manually copy and paste from your pre-RFP outline items to the final proposal outline and articulate things as instructions and quality criteria for the proposal writers. The bulk of the coding we have to do for pre-RFP support will be to streamline this, because we should be able to greatly reduce the number of clicks that are currently involved. The result will be that all of the customer, opportunity, competitive, and other intelligence you gather, along with the work that you do to design your offering and develop your win strategies, will all be in a place where it will be relatively easy to convert it into Proposal Content Plan instructions and quality criteria. Doing this will ensure that your information advantage gets translated into a better proposal with a competitive advantage. Down the road (don’t ask me when, but I'm expecting it to be less than six months), it will become even easier. You’ll click a button to start a new pursuit, set some configuration options, and then go straight into tweaking the questions and instructions that will already be there for your sales/business development staff. It will be easy to enter and build the information you gather. And then at RFP release, you’ll easily map what you’ve got to the Proposal Outline, maybe with some drag and drop. Then, when you are doing your Proposal Content Planning, you’ll have all of your pre-RFP intelligence right there in each section where it’s relevant so that you can turn it into instructions and quality criteria. It will be easier than I’ve ever seen this done before. But you don’t have to wait. You can do it all right now. We didn’t realize that it would work out that way when we built the Proposal Content Planning tool, but we’re glad it did.